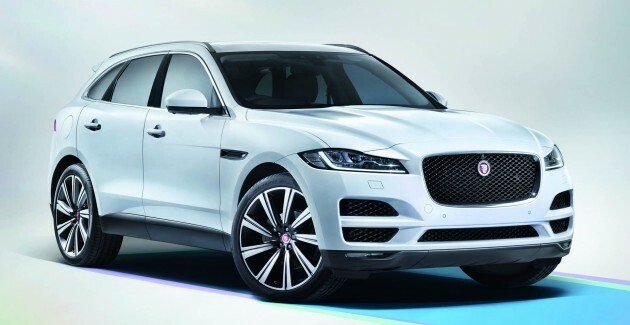 This is the all-new Jaguar F-Pace – the leaping cat’s first SUV has made its official debut at the ongoing 2015 Frankfurt Motor Show. The five-seater measures in at 4,731 mm long, 1,936 mm wide and 1,652 mm high, with a 2,874 mm wheelbase – the automaker says the latter and track dimensions on this one aren’t shared with any other Jaguar. Despite its bulk, the F-Pace is light and features the same torsional stiffness as the new XF – Jaguar’s Lightweight Aluminium Architecture translates to an aluminium-intensive body structure, with 80% aluminium, and additional weight savings come from the composite tailgate and magnesium for certain parts. Kerb weight starts from 1,665 kg for the lightest variant, a rear-wheel drive 180 PS 2.0 litre diesel manual. Three powertrains are available at launch, starting from a new Ingenium 180 PS 2.0 litre diesel mated to either a ZF six-speed manual transmission with rear-wheel drive or all-wheel drive, and an eight-speed automatic with all-wheel drive. This is followed by a 300 PS 3.0 litre V6 diesel paired with an eight-speed automatic and all-wheel drive, and the range-topper is a 380 PS 3.0 litre V6 supercharged petrol mill partnered with an eight-speed automatic and all-wheel drive. Performance numbers include a 0 to 100 km/h sprint time of 5.5 seconds and an electronically-governed 250 km/h top speed in the case of the 380 PS 3.0 litre V6 petrol variant. The SUV features a F-Type-derived double-wishbone front suspension and Integral Link rear suspension from the XE – torque vectoring comes as standard too. Elsewhere, electronically-controlled Adaptive Dynamics ensures optimum damping in all conditions, while Configurable Dynamics – also first seen on the F-Type – allows individual settings for throttle, automatic transmission and steering settings. There’s also Adaptive Surface Response (ASR), developed from Land Rover’s terrain response technology, which optimises the mapping of the powertrain and dynamic stability control elements. Also from LR is All Surface Progress Control (ASPC), a sort of low-speed cruise control that automatically controls the throttle and brakes at up to 30 km/h – all the driver needs to do is steer. It’s compatible with automatic rear- and all-wheel drive variants. If throttle input is desired, there’s Low-Friction Launch (LFL), a function that uses a very progressive throttle map to make the vehicle easier to control; the company says the F-Pace is the first Jaguar to offer it. The SUV is claimed to offer class-leading rear kneeroom, and there’s 650 litres of luggage compartment space, which expands to 1,740 litres with the rear seats folded flat – the load-bay features a 1,255 mm-wide aperture. Speaking of rear seats, the 40:20:40 split seats feature an electric recline function. When it comes to infotainment, the car ships with InControl Touch system and an eight-inch screen as standard. There’s a higher-spec InControl Touch Pro, which has a 60GB solid state drive, runs on an Ethernet network and comes with a 10.2-inch touchscreen. Also on tap are two Meridian digital audio systems, including a 17-speaker, 825-watt surround sound system. Both Android and Apple smartphones are compatible with the systems onboard, while an integrated SIM and the vehicle’s antenna can also function as a Wi-Fi hotspot, with connections for up to eight devices. The vehicle also debuts Jaguar’s ‘Activity Key’, which is a waterproof, shockproof wristband with an integrated transponder, so that the keyfob can be securely locked in the vehicle while the user goes surfing or kayaking, for example. The key has no battery, so when one locks or unlocks the vehicle by holding it close the ‘J’ of the Jaguar lettering on the tailgate, it disables any keyfob left inside. Safety kit includes a raft of advanced driver assistance systems – the autonomous emergency braking system now features a pedestrian detection function, another first on the brand’s vehicles. The system’s stereo camera also enables lane departure warning, lane keep assist, traffic sign recognition, intelligent speed limiter and driver condition monitor systems. The automaker has announced that the F-Pace will be available in four model variants – Prestige, R-Sport, Portfolio and First Edition. The last is a special limited-run range-topping model, with just 2,000 units to be available worldwide. Powered by a 3.0 litre diesel V6, it will come in a unique ‘Caesium Blue’ metallic shade, a homage to the C-X17 concept unveiled at the 2013 Frankfurt Motor Show. The variant will feature 22-inch double helix 15-spoke wheels with a grey finish and contrast inserts, ‘adaptive dynamics’, adaptive LED headlights, gloss black fender vents and a panoramic roof, while inside, there are Windsor soft-grain Light Oyster leather seats with an embossed ‘houndstooth’ pattern inspired by the C-X17’s interior. Standard fitment includes an InControl Touch Pro system and a 12.3-inch HD virtual instrument cluster. The rear design is very nice. Proton should come out with a SUV. All the pariah negative idiots who say it will fail are all white man worshippers. I have faith in Proton. I have faith in BN. It is an honest party and I myself proud owner of a Preve. Proton not going to copy this again? You don’t know Proton likes to copy Jaguar design meh? Tinggal dalam gua ke? Looks good, BMW and Mercedes will have to buckle up for a fierce fight! What a beauty! Paultan pages are full SUVs news. SUV.. Proton.. SUV.. not D segment passanger car. Jaguar is seriously on to a winner here. Based on the US pricing, the F Pace, in 3.0 R Sport form, with all the goods, comes to about 10k USD below a comparatively equipped Macan S.
And mind you, the Macan S is already cheap in the US. A Jag SUV, with all the luxury and performance for about 71k USD? Where do I sign? The basic of F-pace in USD is only 40K-42k, it’s so affordable. It was price below most basic Q5, so this is my car. Looking forward to pick up in another year. Two much-awaited SUV launches of the year. One looks good (Jaguar F-Pace). The other not so much (Bentley Bentayga). Next Post: BMW to work with McLaren on new supercar for 2017?